Groundbreaking! America’s New Quest for Mineral Independence. Dr. Ned Mamula and Ann Bridges. 294 pages. ISBN-13: 978-1729669525 / ISBN-10: 1729669522. What happens when a geologist and an author whose chief interest is California’s Silicon Valley get together to take a look at the United States’ dependence on foreign supplies of critical minerals? The result is a long hard look at how our southern neighbour failed to take advantage of its mineral resources. Instead the authors say that the reliance on foreign supply has created a national security issue. Groundbreaking! looks first at risk/reward, why minerals matter, and the U.S. dependence foreign suppliers for critical minerals. There is a run-down of mineral wealth in the U.S., and how the country should rediscover that wealth. The book has a running theme of the role of domestic mineral production as a national security issue. There are separate chapters on rare earths, the American uranium debacle, and the Pebble gold mine in Alaska. Each is packed with facts, illustrations and tables about its topic. 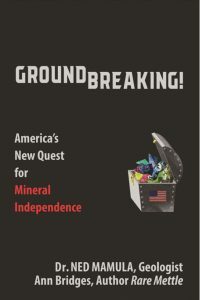 That is followed by three chapters about how the mineral industry is undermined, how to take back America’s mineral future, and a discussion of the growing support for mineral independence. To strengthen national security, the authors recommend keeping mineral ownership in American hands, re-thinking stockpile capabilities, and making plans to address potential disruptions in the supply chains. In their view mineral independence can be promoted by streamlining permitting, stepping up the preparation of geological maps, and finding suitable tax incentives for the domestic mineral industry. The federal government has a role to play. It needs to re-fund the Bureau of Mines and give it a clear, modern mission. Cabinet Secretaries should oversee executive orders related to critical minerals, providing modifications and updates as needed. The government also has an obligation to upgrade environmental protection acts, account for previous land withdrawals, and create partnerships with the environmental community. American citizens, too, need education on the importance of the mineral industry. Mineral basics should be taught at all educational levels. Private/public partnerships and collaborations should be encouraged to teach mining skills. Punitive trade measures are recommended for countries that condone child labour, allow unfair labour practices or are negligent in protecting the environmental. Lastly the authors recommend creating a groundswell of support for mining by contacting elected representatives, and encouraging all industries – not just mining – to take up the cause. If our readers wish to contact Ned Mamula, they may do so at middleburg@mindspring.com or 540-454-3057. He is the adjunct scholar in geosciences at the Centre for the Study of Science, Cato Institute in Washington, DC.